WEST FACING BALCONY in a very clean 1,146 sq ft adult living condo! 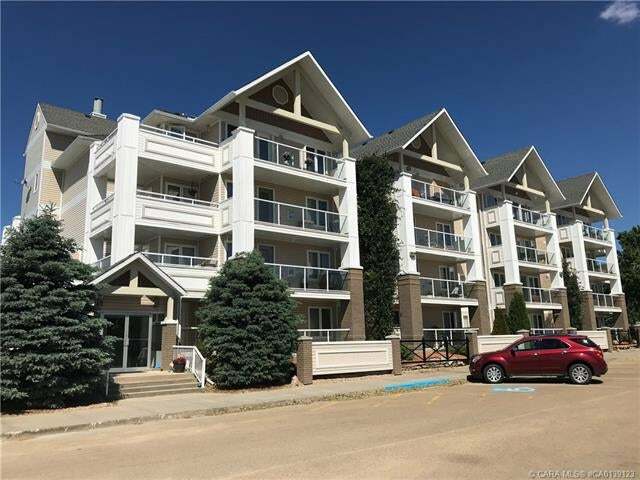 A wonderful 45+ community lifestyle here at Grand Trunk Landing with main floor social room, garbage pickup, underground car wash station, direct mail and recycling options all under one roof - one small pet allowed too! Inviting layout with 2 bed, 2 bath and in suite laundry. Spacious Master Bedroom with 4pc ensuite, a true walk-in closet and a cozy nook with beautiful West facing views. Lovely kitchen arrangement with eating bar, open living and dining area with gas fireplace and a 3pc main bath with accessible walk-in shower. Enjoy the outdoors and evening sunsets on your private West facing deck complete with gas hook up for bbq. All this and an excellent heated underground parking stall plus secured storage. You'll love it!